The Philippines‘ second most violent storm of the year has forced 60,000 people from their homes, and killed at least two people already. 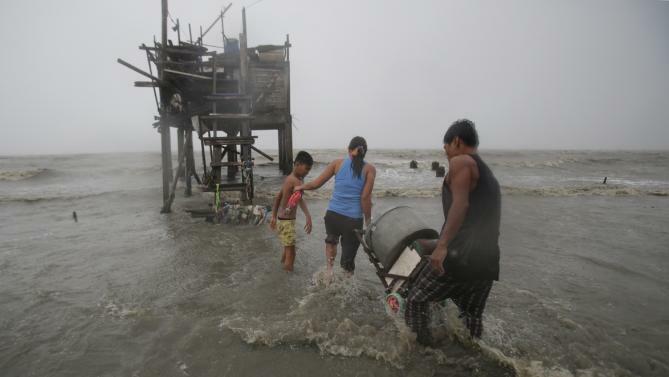 Typhoon Koppu made landfall on Sunday, striking the east side of the Philippines’ largest island, Luzon, with winds up to 210 kmp/h, and heavy rains. Military units, local governments and volunteer forces set out to help the many thousands of villagers who are stranded because of the rising waters. Up to 70 villages are already thought to be submerged, whereas others are yet knee-deep. The exact number of people stranded is as yet too early to determine, but the number is said to be in the many thousands. Farm animals, white goods, as well as vehicles and crops are also being taken into account as part of the damage to farming communities. People in rural areas were said to have believed the storm passed the low-lying farming regions, travelling North. But Koppu has still been dumping rain over the country, severely affecting rural areas, and many thousands of hectares of rice paddies are said to be damaged. There is no way of establishing whether Koppu is directly caused by climate change, but it can be said that the typhoon has caused what can be termed climate-refugees. We can also say that the number of refugees could have been reduced – or managed better – if information was disseminated to rural areas quicker. The Philippines can learn from this horrendous experience, as can the rest of the world: not providing quick responses to climate-events like this can not only cause damage to property, but also the loss of life.